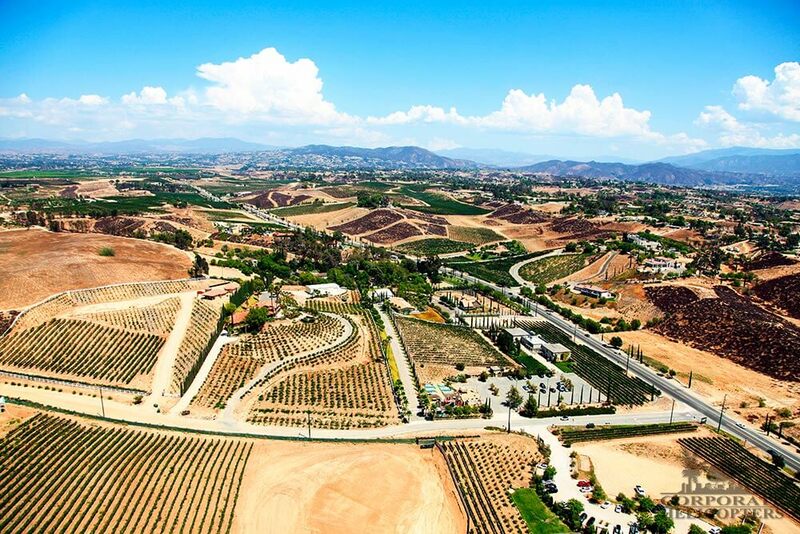 A Temecula wine country helicopter adventure. Turn your winery trip into a winery adventure that you and your guests will never forget. Turn your winery trip into an adventure that won’t ever be forgotten. 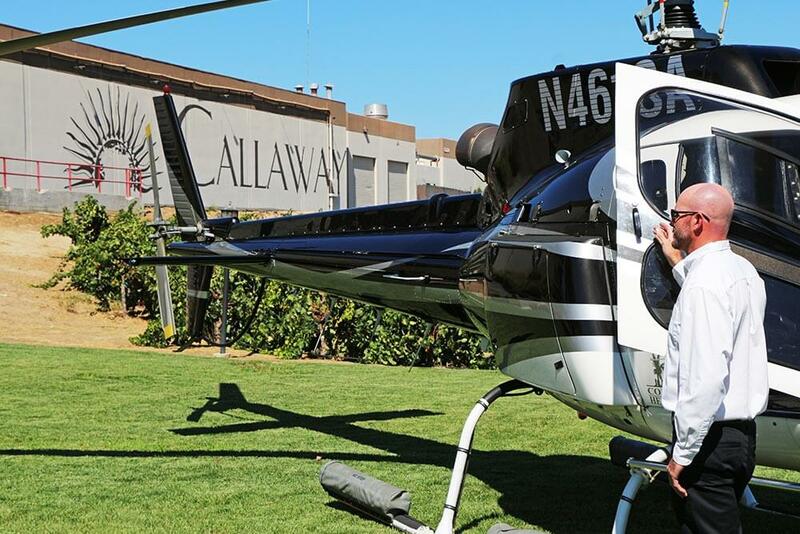 Includes helicopter tour to Callaway Winery, and a different tour on the way back. Buy a gift card for this tour. A breathtaking coastal & valley flight. 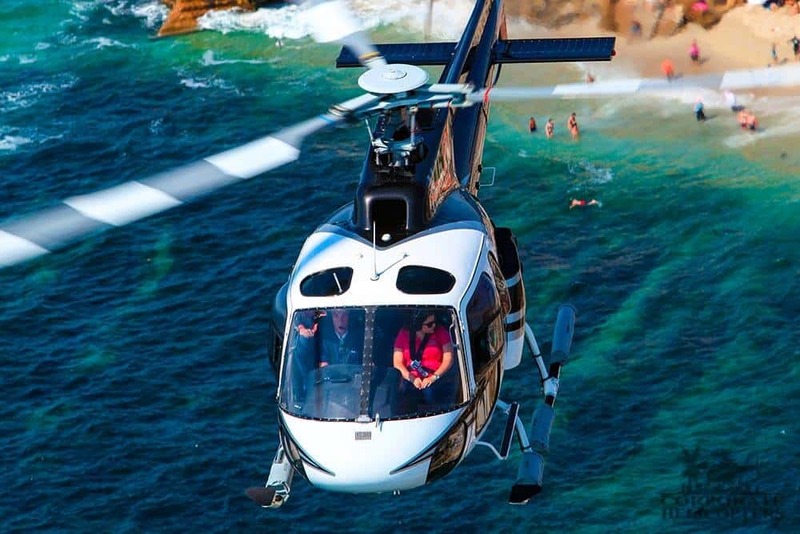 Fly along the coastline from La Jolla Shores to Solana Beach. Soar past exotic beaches, back country scenery and luxury homes. Head inland over rugged mountains and through beautiful Temecula Valley. Arrive in style Callaway Winery. 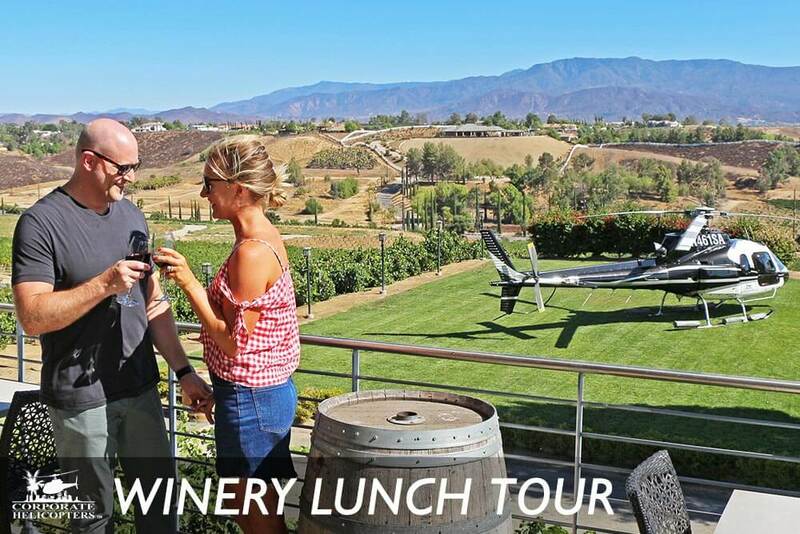 The helicopter will be on standby, as you enjoy a wine tasting & winery tour, and farm-to-table lunch. *Wine tasting & Wine tour is $35 per person. You can purchase this at booking or at flight check-in. If you book a private flight, it’s included! Enjoy 2 hours of world-class wine & food. Once you land at Callaway Winery, you will be greeted with champagne and escorted to a scheduled winery tour and tasting that will last around 45 minutes. After you’ve tasted a variety of wines, you will partake in a farm-to-table lunch at Meritage. 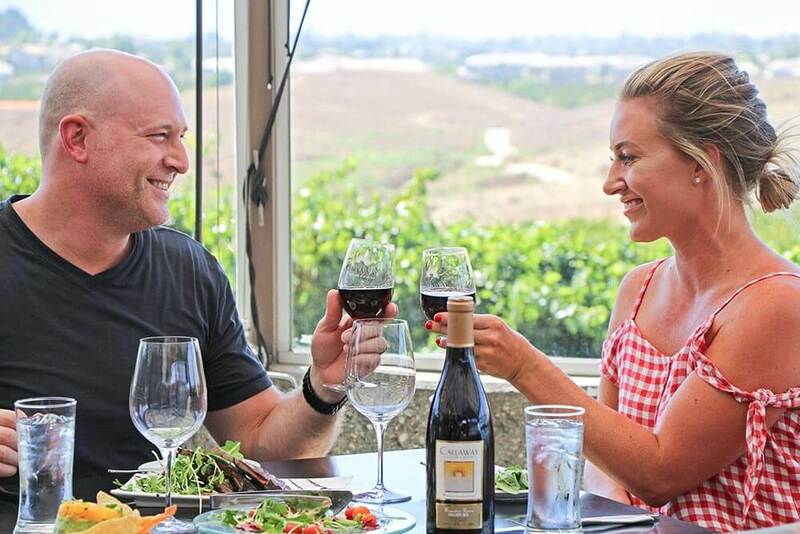 Sitting high atop Temecula’s breathtaking wine country, Meritage at Callaway offers guests incredible panoramic views of the rolling hills and vineyards. Should you decide to take a case of wine home with you, we have ample room in our baggage compartment. Note: Lunch is not included in the flight cost, you will pay at the restaurant. You can purchase the wine tour & tasting at booking (online or over the phone). Return to San Diego on a different flight route. 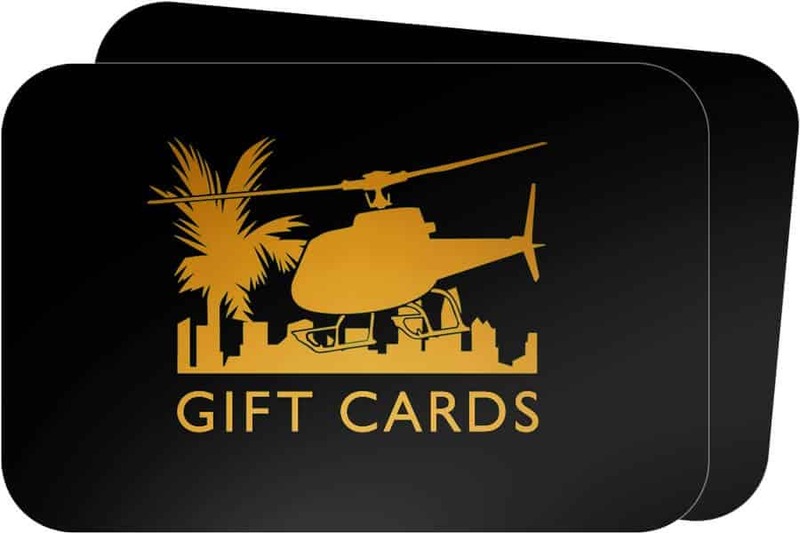 Your helicopter will return to San Diego via a different, scenic inland route. Witness a view only adventurers know. Note: All times listed above are approximate. Corporate Helicopters of San Diego made my wedding proposal happen! When they mentioned that they do direct flights to the Thornton Winery I knew that it would be perfect for what I was looking for. Everyone at CHSD made our experience special and memorable. I can’t thank them enough for going above and beyond to take care of all our requests. The flight was amazing and something we will never forget and plan to do many more times! My boyfriend surprised me and took me on the “Surf and Turf” tour for Valentine’s Day. It was incredible! Our favorite parts were seeing the San Diego Wild Animal Park from the air, seeing a whale in La Jolla, flying by downtown, and seeing Coronado. Our pilot / tour guide was Bryan, and he couldn’t have been nicer. He was more than happy to loop around and see a couple nice houses that we liked. I really recommend it! “I booked a flight as a birthday present for my girlfriend, her daughter and I. The reservation process was flawless and effortless. The flight itself was amazing and the pilot was great. We had such a blast and already planning another adventure. Thank you so much Corporate Helicopters. You guys are awesome!!!! If you’re looking for a little excitement in San Diego, these tours are a once in a lifetime experience! If you are ever in San Diego, you have to visit Corporate Helicopters and take a tour. Our pilot was great and I was so comfortable. It was one of the highlights of my trip! The highlight of our vacation. Breath taking! One of the things you have to do in your lifetime!